Corner view of the Cocoon by Sealy mattress. The Cocoon mattress is Sealy's first online-only mattress, made of memory foam over foam. It competes in a crowded field, so how does it compare? Get a trusted Sealy quality mattress delivered to your door. 130 years of quality. 40 million mattresses. Feel the Sealy difference for yourself. From unboxing to relaxing, our owners love how easy it is to get a premium memory foam mattress shipped to their door. Whether you want softer, firmer, or cooler, we have a premium memory foam mattress that works for you. Classic - Features premium memory foam. Chill - Features premium memory foam coupled with innovative cooling technology. We want to make sure you’re getting the best sleep of your life. If you don’t love it after 100 nights, you’re covered by our hassle free promise. We’ll refund you, pick up your mattress, and donate it to charity. 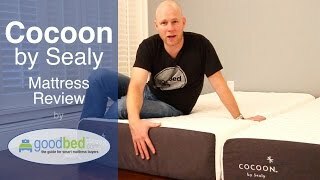 To decide whether Cocoon is the right choice for you, read GoodBed's expert review of the Cocoon by Sealy mattress or watch our in-depth video review of the Cocoon mattress. Is Cocoon the right bed for you? Cocoon mattresses are recommended by 67% of owners on GoodBed (based on 12 ratings). Do you have something to say about your Cocoon mattress? Write a Review! There are 12 ratings on GoodBed for Cocoon, but no reviews yet. Be the first. Cover Details: Premium stretch-knit cover infused with "Phase Change Material" that absorbs and dissipates heat for a cool to the touch surface. Comfort Layer Details: Top layer of premium memory foam. Transitional foam layer for desired comfort level. Support Layer Details: High density support foam. Note: The product line specifications above were derived from the active Cocoon models listed on GoodBed. As a result, these details may not be comprehensive and may not apply to all Cocoon models. If you are seeking specifications for a particular Cocoon mattress, please search for that mattress by name on GoodBed, or check with your local Cocoon dealer. Which mattress from Cocoon is best for you? Before shopping at Cocoon, take a short quiz to find which of their mattresses best matches your unique needs and preferences. Powered by GoodBed’s intelligent matching technology, you can even get your personal match score for each of Cocoon's available mattresses, in addition to other online options that match your criteria. A Better Night's Sleep Without Leaving the House. Cocoon is a mattress manufacturer founded in 2016 that is based in Lexington, KY in the United States. Cocoon is the online consumer-direct offering from Sealy. Have an update or correction to our information about Cocoon? If so, please take a moment to suggest an edit. Cocoon mattresses sold by Cocoon come with a 100-night in-home trial. If you don't love your Cocoon mattress, Sealy will arrange to pick it up and donate it to a local agency. Zero cost with a full refund of your purchase price.